FILE - Paul Manafort, President Donald Trump's former campaign chairman, departs Federal District Court, Nov. 2, 2017, in Washington. Manafort is awaiting trial in Virginia this summer and in federal court in Washington this fall. He faces charges related to his work for pro-Russia Ukrainian political interests. Manafort was jailed last month after a judge revoked his house arrest over allegations of witness tampering in Mueller's Russia probe. 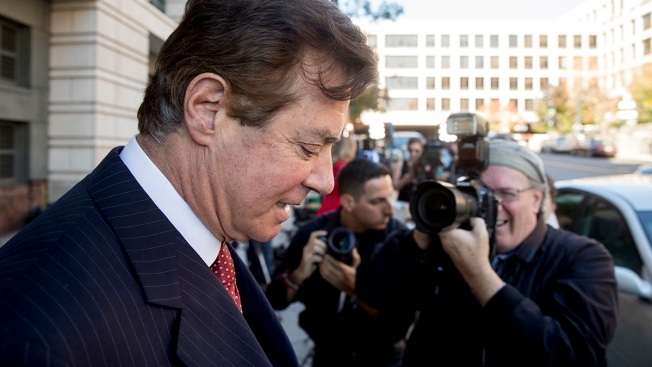 Lawyers for Paul Manafort, President Donald Trump's former campaign chairman, asked a federal judge Friday to relocate a criminal trial starting later this month because of pretrial publicity. The financial crimes trial of Manafort is scheduled to start July 25 in Alexandria, Virginia, just outside Washington. But his lawyers argued in court papers Friday that it would be impossible for Manafort to receive a fair trial because of the intense media coverage surrounding his case and special counsel Robert Mueller's investigation. They asked for the trial to be relocated to the more sparsely populated city of Roanoke in southwest Virginia. The lawyers say that while the Washington region ranks first in the nation in households with computers and Internet access, "Roanoke is the 70th largest media outlet in the United States and 38% of households in Roanoke lack broadband compared to 3% in Northern Virginia." A Google search for news articles about "Russian collusion" turned up 2,900,000 results, and thousands of articles have been focused on Manafort. "Reviewing these articles, one is hard pressed to find any that are not unfavorable to Mr. Manafort," the defense lawyers say. In addition, they say, voters in the Virginia region where jurors would be drawn from voted 2-1 in favor of Democratic presidential candidate Hillary Clinton, Trump's opponent, while "this split is more balanced" in Roanoke. "Nowhere in the country is the bias against Mr. Manafort more apparent than here in the Washington, D.C. metropolitan area," they wrote. He faces charges related to his work for pro-Russia Ukrainian political interests. The charges don't relate to the core focus of the Mueller investigation — potential coordination between the Trump campaign and Russia — and prosecutors said in a court filing that they do not intend to raise allegations of collusion. But they do say they plan to present evidence that a bank executive who approved a loan to Manafort expressed interest in working on the Trump campaign, told Manafort about that interest and eventually secured a position advising the Trump campaign. "In short," prosecutors wrote, "the defendant's role with the Trump campaign is relevant and inextricably intertwined with the Lender D bank fraud and bank fraud conspiracy charges. Here, it would be difficult for the jury to understand why the loans were approved without understanding that the lender approved the loans, in spite of the identified deficiencies, because the senior executive factored in his own personal ambition." Manafort was jailed last month after a federal judge revoked his house arrest over allegations of witness tampering in Mueller's investigation. Defense lawyers said in court papers Thursday that Manafort is locked in a jail cell in Virginia for 23 hours a day, excluding visits from his attorneys, and has been in solitary confinement because the facility can't guarantee his safety. The lawyers are asking a federal appeals court to overturn the judge's order and release him under certain conditions as he awaits trial. The lawyers said his detention makes it "effectively impossible" for Manafort to prepare for trial. They said the judge, Amy Berman Jackson, did not analyze carefully enough whether Manafort had actually committed witness tampering. "Independently, the alleged evidence of obstruction is so thin that it cannot reasonably support the determination that no set of conditions could ensure Mr. Manafort's appearance and the safety of the community," Thursday's court filing states. Manafort is one of four Trump campaign or White House aides to have been charged in Mueller's investigation. Three others — George Papadopoulos, Michael Flynn and Rick Gates — have pleaded guilty and agreed to cooperate with investigators.